Reel Talk Online: "The Fighter"
You're probably thinking, Not another boxing movie! But, although The Fighter is about '80s local boxing legend Mickey Ward and his rise to fame, rest assured that this is not a boxing movie. At its core, The Fighter is a family drama. Oscar nominee Mark Wahlberg plays Mickey, a talented boxer from Lowell, Mass. with a crack fiend brother (Dicky, played by Christian Bale) for a trainer, a pushy mother (Melissa Leo), seven nosy sisters and a real big problem--them. All his life Mickey has looked up to his older brother Dicky, a great ex-boxer in his own right who's devoted the rest of his fleeting career to teaching his younger brother how to become the boxer he never could be. But Dicky is trouble--showing up two hours late to training, finding him on top of a garbage pile behind a crackhouse, erratic and irrational. In between his crack haze, he does manage to muster up a few solid pieces of advice. Their mother Alice is no price either--the red-nailed, spandex-wearing mom of nine turns a blind eye to her son's struggles with addiction to concentrate on how her other son can make money for the entire family as a boxer, even if that means setting him up on a few fights he's not ready for. Then there's Mickey's girlfriend Charlene (Amy Adams), the foul-mouthed bar maven who feels there's only room for her in his corner. Each member tries to take their part in Mickey's life, leaving him with nothing to spare for himself. But it's his brother who ultimately gives him back that victory, when he finally takes a step back himself. Their brotherly bond isn't without its share of fights and turmoil--especially when Mickey for the first time in his life has to face his brother rather than look up to him as he always had, even in his darkest moments. But at the end of the day they're family and, even when they're at their craziest, they somehow find a way lead Mickey to realize his dream. Those same influences in Mickey's life are played by actors whose performances we'll remember most in this movie. It's not only Bale's corpse-like appearance and sunken eyes whose image we won't be able to get out of our heads. His performance is tour de force, writhing though every scene and snatching it from everyone else. He brilliantly portrayed a man whose emotions were often scattered, yet centered when they needed to be. Leo, whose fashion sense in the film could best be described as a 80s-styled Carmela Soprano, was heartbreaking as a mother who only wants what's best for her children--even if she can't stopped flapping her gums long enough to find out what that is. Adams is impressive in a meaty role she can finally sink her teeth into. Wahlberg takes on an ambitious project (he also produced the film) and clearly had a lot of great actors in his corner. Even thought they each outshined him in their performances, Wahlberg held his own too. 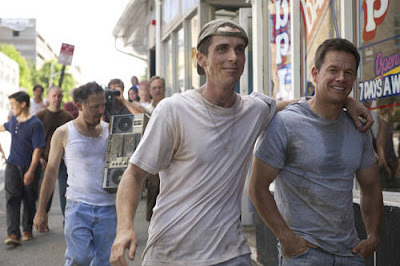 Overall The Fighter is a touching, soulful knockout of a movie. Thanks for the review Candice. Now I'm interested in seeing this movie. I bumped into Toronto film critic Richard Crouse just yesterday who just interviewed Mark Wahlberg. What a cool job!